Saint Patrick banishes all the snakes from Ireland. The small population of snakes in Ireland gave rise to the legend of Saint Patrick banishing all of the snakes from Ireland. 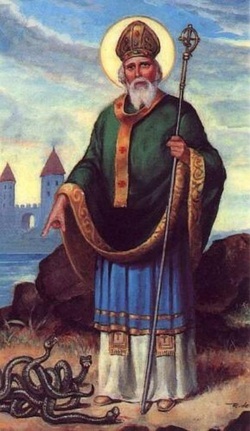 Patrick supposedly banished all the snakes into the sea after they attacked Saint Patrick during a forty-day fast that he under took on the top of a hill. All of the evidence seems to show that there were not any snakes in postglacial Ireland. The only reptile that looked like a snake in Ireland is the slow worm. This was actually a type of lizard, which possessed no legs. The slow worm was introduced to Ireland in the 1960s. This evidence would tell us that Saint Patrick did not really have any thing to banish. The word ‘snakes’ might have referred to as the serpent symbol of the Druids.